Those three words are likely to send any baseball fan into hysterics. While much of the country endures the usual blistering winter cold, the sunny skies of Arizona and Florida will greet millions of baseball fans this February and March for spring training. Even if you plan spring training like some strenuous road trip, you can’t watch baseball for 24 hours. Thankfully the Grand Canyon and Sunshine states have burgeoning and adventurous craft beer scenes. And their warmer climates mean you’ll be thirsty more often … right? So, if you’re heading to spring training, seek a brewery near your team’s practice site. Here’s a primer – a couple warm-up tosses, if you will. Step up to the plate, err, pint. Arguably the most beloved Arizona brewing operation, Four Peaks resides in a Mission Revival-style former ice factory in Tempe, home to Angels spring training (and close to the Cubs and Athletics over in Mesa). Producing its first batches in 1996, Four Peaks was at the forefront of the craft beer movement and continues strong today, even though it was acquired by Anheuser Busch last year. Its ol’ dependable is Kilt Lifter, a Scottish ale with five Great American Beer Festival medals to its tartan. Four Peaks also nods to its desert locale with its sessionable Peach Ale and the White Ale, which incorporates local oranges and wheat. Being around for more than 20 years (and with multiple locations, including in nearby Scottsdale), Four Peaks has a little bit of everything, a good primer of Cactus beer culture. If in Phoenix for Brewers spring training (they play in the city’s Maryvale neighborhood), Wren House is a must. Operating in a circa 1922 house with hardwood floors and subway-tile backsplash, the former Westward Brewery is devoted to stretching the boundaries of experimentation by scouring the globe for recipes. Ethiopian coffee beans fuel its Jomax oatmeal stout, while Celtic sea salt freshens up its Lady Banks gose. There’s also a beer brewed with desert honey, cardamom, ginger, cinnamon, and chocolate wheat (Chai Jolly), plenty of west- and east-coast IPAs and big imperials, and an active barrel program. Tons of variety. With two locations nine miles apart and close to the Rockies’, Diamondbacks’ and Giants’ practice sites, McFate Brewing offers two distinct locations for enjoying their suds. The intimate McFate’s Tap and Barrel in North Scottsdale is more of a pub with pizzas and Sunday brunch, while the McFate Brewing Company in South Scottsdale has a larger menu, beer garden, and barrel room. But what about the beer? McFate loves small-batch and staggering variety, serving everything from a gingerbread stout and an orange-chocolate brown ale to a “kimchi” session IPA and grapefruit Berliner weisse. Taps change all the time at both locations. Compared to the Tempe and Scottsdale areas, the western end of the Cactus League is lighter on craft beer. But that also means there’s a wild-west vibe to the area, which is home to a bunch of teams (Rangers, Royals, Padres, Mariners, White Sox, Dodgers, Indians and Reds). Near the Sox and Dodgers in Peoria is Peoria Artisan Brewery, a tale of a homebrewer done good with inventive takes on relatively popular styles. Co-owner Matt Frosch and brewer friend Neal Farrell started in a garage in 2011; fast forward to today, and Frosch and his team produce drinks like the hop-heavy Savannah Marie IPA, a popular peanut butter porter, and its Honeysuckle Street Ale, a light amber designed for generous refills. Peoria Artisan also has two locations: its brewery and gastropub in Peoria, and its small-batch and light-bite taproom in Litchfield Park, closer to Goodyear where the Indians and Reds play. 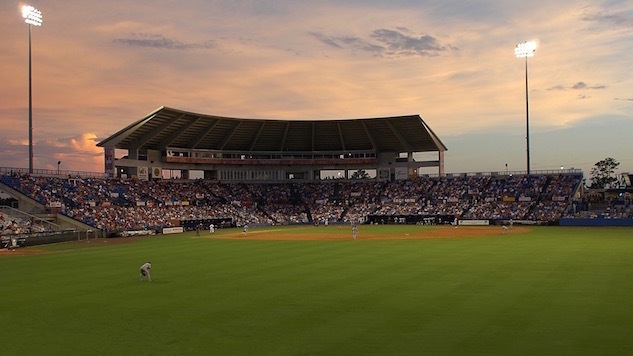 The spring training sites in the Grapefruit League carry an impressive range, from old concrete stadiums in smaller residential cities (the Blue Jays in Dunedin) to massive complexes in literal amusement parks (the Braves at Walt Disney World, at least until 2019). Since the sites are spread out, it means plenty of small breweries are vying for folks’ hard-earned spring vacation cash. And that means the beer also carries an impressive range. No Florida brewery carries a reputation like Cigar City, a nationally recognized brand with a slew of delicious offerings that stay true to the area’s Latino culture. You can always find its trademark Jai Alai IPA and Florida Cracker white ale in the wild, but it’s worth a trip to the brewery to sample its superb imperial stouts, like its Marshal Zhukov’s bourbon-barrel-aged and vanilla hazelnut styles. Cigar City also showcases nitro styles in its taproom, including its coconut flan ale El Coco. A pilgrimage to Cigar City is necessary when in the Tampa-St. Petersburg-Clearwater area, which plays host to the Yankees, Phillies, and Blue Jays, serving as a substantial hub for spring baseball. A popular spot for Red Sox and Twins fans, Fort Myers Brewing Co. was voted the best large brewery in Florida in the 2016 Best Florida Beer Competition. The brewery carries a variety of sessionable core beers, including its chocolate-tinged brown ale Tamiami Tan, while rotating a bunch of specialty small-batch styles, like the mango-and-habanero-flavored Fuego 5. Heading to Fort Myers at the end of February? The brewery is celebrating its four-year anniversary Feb. 23-26 with a mile-long beer run, food trucks, bands and more. Not only is Civil Society smack in the heart of a baseball town (the Cardinals and Marlins play in Jupiter), but the brewery is co-owned by a ballplayer. Chris Volstad, who has pitched for the Marlins among others, helps brewer brother Karl Volstad and brewer Evan Miller run the show. This family operation (even the fermenting tanks are named after family members) specializes in hops, from double IPAs like Seventh Wonder and Flan, to the double-dry-hopped Emerald Showers and double-dry-hopped wheat ale Pulp, a fan favorite. Co-founded by brothers-in-law who served together in the Navy and were stationed in San Diego, this brewery, founded in 2016, is a combination of Southern California hop power and Florida citrus. Calusa Citra hops for its killer IPA Citronious, plus its 1819 IPA, which also has Amarillo hops. Going further, its saison, Surrender, is citrus-heavy in aroma and taste. Like many Florida breweries, Calusa features independent food trucks; unlike many Florida breweries, Calusa brews its own French roast coffee. It maintains a 9,500-square-foot warehouse in the home of Orioles’ spring training.